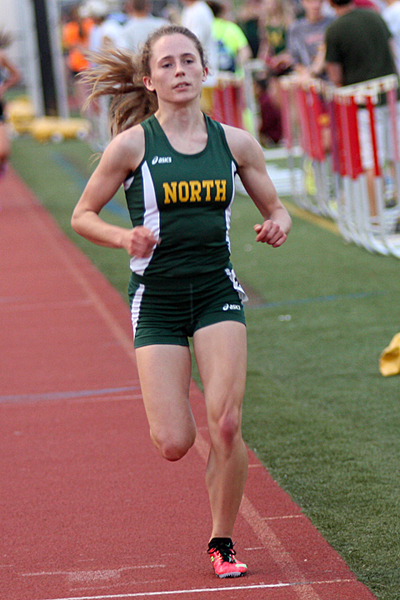 The history of Girls distance running in the Skyland Conference is rich. The talent in this region of NJ just keeps coming year after year. This year’s edition of the Skyland Conference Outdoor Championships showed, once again, the talent and depth that makes this a great meet. In between the bookends that were Glasergreen’s impressive double, the talented Ridge HS (Basking Ridge) ladies were making their own noise. Of the 93 points available in the 3 distance events, The Red Raiders scored over 40% of them. Impressive indeed. Abigail Regner accounted for 18 of those points with her runner up finish in the 1600m (5:11.04) and her win over team mate Kelly Van Baalen in the 800m (2:18.39 to 2:18.46). Both girls came back, Regner for her third appearance on the track, in the meet ending 4x400m Relay. Ridge added to their point total by winning that event as well. This entry was posted on May 8, 2015 by Patrick Montferrat in Uncategorized.